The waterproof swim bag trusted by professionals, vacationers, swimmers & aquatic athletes! This flotation cushion is strong, super durable & the interior is 100% weather-resistant when locked. Though it is rugged & heavy duty, the inflatable buoy is also conveniently lightweight & easy to pack. swim freely & comfortably. You'll even swim much faster since you won't have to hold anything by hand! With a 28L capacity, our swimming buoy is big enough to hold all of your swim gear & keep it dry. Load it with a towel, your swim goggles, a dry swimsuit, your wallet, your car keys, water shoes, etc. Use it as a jet ski buoy, a buoy for boat cruising, an open water swim buoy or a float drybag for kayak trips. Can also be used as canoe float bags, buoy training aid, a buoy for swimming pools + so much more. 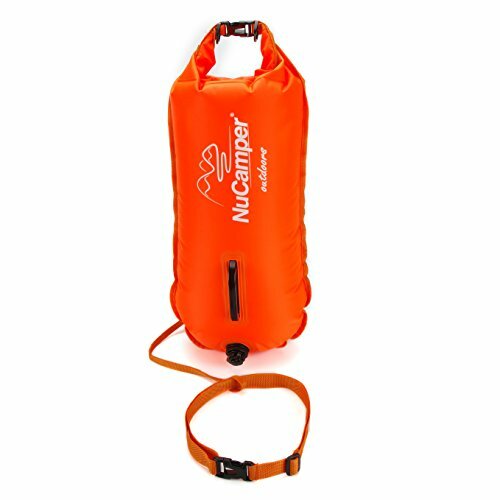 NuCamper Float Bag Dimensions Before Inflation: 28 3/8" x 14 1/8"
Our swim bag pouch is the swim gear accessory you've been dreaming of. Don't think so? Give it a try for yourself ... Click 'ADD TO CART' to order your buoy float bag now! If you have any questions about this product by NuCamper, contact us by completing and submitting the form below. If you are looking for a specif part number, please include it with your message.